Here is proof of more good results with the copper and cobalt glaze I talked about a few posts ago. I'm not going to go so far as to call it bullet proof but it's being fairly consistent in terms of colors and results while still offering surprises. 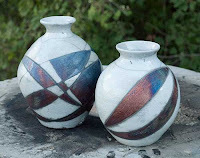 Not sure you can ask more from a good raku glaze. I'm going to work on some more complex designs since I've run out of test pots and I have some ideas now. Plus it's fall which makes for good firing weather especially at night. And speaking of projects, I set a new gallon of mead to brew and added cinnamon to another gallon in the hopes of making a metheglin. Maybe it will be ready to drink by the holidays which will be pushing it but one can hope. I'm ready to move up to five gallon batches I think but I'm also wondering if I can throw my own carboys. It would be a challenge but to have three or four ceramic carboys of ones own design and creation would be a lot of fun. So sipping cinnamon mead while watching a kiln burning in the cool of the night will be happening this year. If the mead makes good and the kiln don't fall apart. If anything intimidated me about yoga before I began a regular practice, it was the Sanskrit. The language is beautiful to hear but if you look at it written out and romanized, it looks like huge lengths of unpronounceable words. But with any yoga practice, even a superficial one that only focuses on the asanas, one is going to run into Sanskrit. Now you can fake it pretty easily. Jump on Youtube and listen to a few yoga lessons and you'll hear the terms bandied about and you'll hear multiple versions of the same word. Pick one you like and you're done. But if you catch one that actually pronounces the words with the right inflection, it sounds musical and almost magical. That's what I want. And I want the confidence to say it the way it was meant to be heard. So Youtube is not going to cut it. I need a more direct approach that gives me the words I need. A quick internet search lead to The Language of Yoga: Complete A to Y Guide to Asana Names, Sanskrit Terms, and Chants . I'm familiar with Mr. Bachman's work from The Path of the Yoga Sutras: A Practical Guide to the Core of Yoga which has pretty much become my favorite yoga book for a variety of reasons and it is also the reason my interest in the language was piqued. I like his writing style and enjoy his illuminations on the subject matter so it was an easy sell. The Language of Yoga is hard-backed with a spiral binding and let me just say that all books should come that way. It lays flat and stays where you put it. And there's not much to it. It comes with two CD's and the book basically consists of the texts from the CD's. This is a good thing. No frills, just the yoga related words listed in their romanized version, the sanskrit version and it's translation. On the CD, each word is spoken twice with a slight pause after and then the translation. Common chants are covered (not working on those anytime soon but they are interesting to hear), basic terms, basic numbers, chakras, mudras, astanga and asanas plus a whole lot more. The second CD is devoted to the asana names and organized for easy reference. I've always had an interest in languages even though a lack of time and a short attention span has kept me fluent in only one. Three years of high school french left me able to read french on a good day. I have maybe fifty or so spanish words at my disposal. You might recall I tackled old english a while back and enjoyed it thoroughly. And of course there was Klingon back in the day which was also a lot of fun. I've tried language tapes and online apps but attention wavers and no one else I know wants to speak Klingon so you move on. But I still enjoy the study and the window into another culture that working with an unfamiliar language provides. I don't have to be fluent. I just want to dip my intellectual toes in and test the waters of another headspace. Which is why I think there should be books such as Mr. Bachman's for every language. Give me the rules of pronunciation, give me the basic words such as numbers and days of the week and a CD to let me know how it all sounds and get out of my way. I would make it my mission to own every such book so that on a rainy day I could try my hand at hungarian or russian or even chinese. No commitment. No pressure. Just the sounds of another world rolling off the tongue for an afternoon. And let it be stated that I would absolutely do deeply embarrassing things for a book that broke down gaelic is such a way. Just sayin'. I can't recommend The Language of Yoga enough to students and practitioners. I think having the confidence of the proper pronunciation can add a subtle element to your practice that can take you deeper into the traditions and here it all is in a simple, little book and at a great price. This is day four of the no-coffee experiment and the worst is pretty much behind me. It takes three days for just about anything to get out of your system. For instance, if you can get to day four without a cigarette, anything left is psychological. It appears that the same goes for caffeine. I've also noticed that anxiety levels are down. Little things that normally bother me happened a lot today but for some reason I just shrugged and got on with it. This will be something to pay attention to as this moves along. If I can count on reduced stress and tension from avoiding caffeine then I'll avoid caffeine and I would suggest that anyone who has any sort of anxiety or stress related issues should calculate their intake see if there is a correlation. As far as the meditation practice, it goes deeper and quieter with less time spent chasing random thoughts. This will also need to be monitored as the days go by but the static is gone and that's what I wanted to achieve. But let's keep in mind that this is still an experiment. The holidays are coming and that means chaos in terms of keeping to the diet especially with a hectic schedule. But we'll see. I've committed to sticking to the program this year and that means searching for paleo friendly desserts. But we'll talk about that when it gets a bit closer to the holidays. I'm not sure this particular experience qualifies since I've had a much harder time giving up things like sugar and nicotine but it's still a serious challenge to wade through the symptoms of withdrawal knowing that relief is a simple cup of coffee away. Today the lethargy let up significantly only to be replaced by deep seated headaches. A little bit of ibuprofen solved that so it really hasn't been that bad. Perception has slowed and mentally I'm not as sharp but I think that will come back in time. Still breathing and, in a fortunate twist of fate, tonight's yoga class focused on pranayama and that pretty much killed the last of the symptoms. For now at least. I wish I had known even a little about breathwork with I gave up cigarettes the first time. As far as the meditation practice, I'm finding the cave pretty quickly but at this point in the process, the symptoms pull me out. So that will get better with time. Dreamtime continues to be longer, more fluid and more involved. The experiment continues tonight and tomorrow. So I gave up coffee this week as part of a little experiment. The meditations have become deeper and more meaningful as an extension of the yoga practice but I've detected obstacles. I can sit and find a little cave in my mind and rest there for a moment or two, observing thoughts as they pass by the entrance the cave, trying not to judge. Just watching for as long as I can until I get lost in the stream again. It gets easier with practice and the time in the cave gets longer and longer and sometimes the thoughts zipping by actually slow down and every great once in a while . . . they stop. And that's where it gets interesting. In the absence of thought is the magnification of the moment and that's when harmony settles in and there is peace. But getting to that sacred point takes all kinds of practice and, while I'm happy with my progress so far through the immersion course, I want the meditation side of things to be more focused and available. I want to capitalize on my success and move forward but to do so means pinpointing anything that's in the way or detrimental to the process. So we first need to analyze the process. And it should be stated that the experience of meditation can be very subjective. A person can be told exactly what to do and how to do it but as that person begins the practice, her experience will be her own and I think that's why so many get frustrated and quit. People like rules and structure and they want to know exactly what's going to happen and what to expect and how to gauge success. This gets tricky since the gauge of success in this instance has more to do with what you are not doing as opposed to what you are doing right. Another source of frustration is that some who would write books on the subject get locked into the idea that their way is the only way and so when someone tries their way and fails, they assume they will never succeed and give up all together. So the key is to take everything with a proverbial grain of salt and experiment. Read books, watch videos, listen to cd's or, better yet, just do it and find your own way. So back to analyzing the practice. For me, that means sitting or lying in a quiet place and breathing. Most of the time I use ujjayi which calms the mind and fuels the system or I might use a rhythmic breath for a more structured approach. Depending on the day, the mood, the moon and so on, I should be in a relaxed state of mind in a few minutes. Then I try to sink my awareness inward and sit. Thoughts still rush by but I try to observe as opposed to participating. Usually, the more I breath, the more I observe, the slower the thoughts become until I can listen to something else. The thoughts almost become background noise that can be ignored. Now all of this is on a good day, usually after a heavy yoga session at the studio and before the worries of the world come crashing back down. There is the cadence of the breath and an inner awareness of worked muscles and open spaces. On a not so good day I might not get past just slowing the thoughts down for a little while and following the breath. That's ok though. I know that my blood pressure has dropped at the very least and that's worth the practice in itself. But let's assume a good day. Thoughts are slowing down and I can listen. I might check in on the chakras but for the most part, I just observe. But what is that in the background? It's not a thought really or a song. It's just static, like a old tv tuned to a dead channel. Interference really. And what could be causing that? Well, caffeine is the primary suspect at this point and I didn't even have to think that hard to come to that conclusion. My normal intake is about two cups of coffee in the morning, tea for lunch, either coffee or (gasp!) an energy drink in the afternoon and then tea for dinner. Sometimes a lot of tea for dinner. So my intake is high and I'm almost certain it's the source the static. But let's experiment and find out for sure. So for this week, no coffee and we are switching to green tea. Next week i may try giving up the green tea if this produces the desired effect even though there is a remarkable difference between the caffeine's of green tea, black tea and coffee. Case in point, I drank one cup of green tea yesterday morning instead of my normal two cups of coffee and I swear reality still dropped into low gear. Time actually appeared to be moving at a completely different rate sans coffee. It was actually pretty fascinating and pretty annoying. Mid-afternoon is a nightmare of sluggishness and slow thinking. I also noticed a lack of balance in the yoga practice last night but then I remembered kapalabhati which is an energizing breath and after a few rounds I felt pretty normal. I also noticed an increase in dream time while I was sleeping last night which is very interesting but makes sense. But that could be psychosomatic. So this morning began with more kapalabhati and green tea and reality still seems downshifted but some of the sluggishness is already lifting. I had an intermediate yoga class tonight that left me pretty wrung out (in a good way) and I think moved me even further into detox than I was. I'll meditate tonight and report back tomorrow but I'm amazed as the difference already. On Sunday, I discovered that I had an almost full tank of propane and that completely derailed my carefully constructed list of chores since I knew I had bisque sitting on a shelf just waiting for a new glaze recipe. So some chores were ditched and some hurried through so I could get have enough daylight to at least get started. I don't mind finishing in the dark. It makes it easier to see into the kiln. 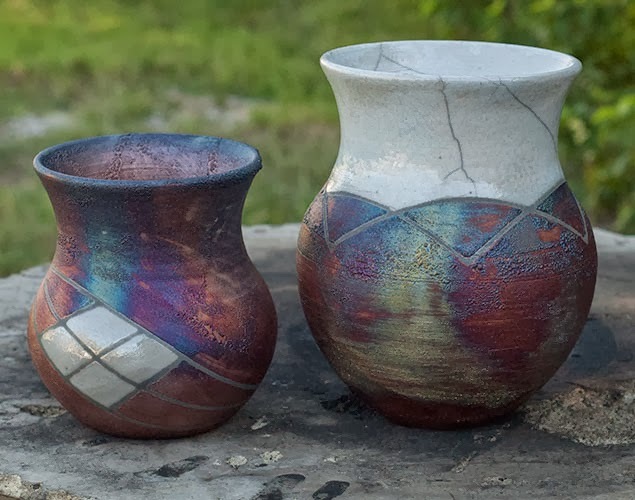 So I whipped out one of my favorite sources for alternative firing methods (Alternative Kilns & Firing Techniques ) and worried over the recipes in the back until I came across a copper matte that I hadn't noticed before that included copper carbonate and cobalt oxide. I use copper all the time, always looking for that splash of shiny penny or hint of red. Adding cobalt to the mix means blues are almost guaranteed especially with the oxide as opposed to the carbonate. Not really sure how this particular recipe escaped me for so long but it would be the glaze of the day. So there was some scurrying and some glazing and some set up but in short order a tongue of orange flame graced the chimney of the kiln while I worked through a yoga routine on the nearby porch. That was a bit of an experience. It was dark save for the light from the kiln as I focused on my own breath while using that rumbling white noise of the focused flame to keep me centered. Then I bent into an arch from a warrior pose, opened my eyes and saw the stars above. There was a perfect moment there. The kiln breathed and I breathed and I could feel the stars breathing as the flame danced and the glazes ran and created something new in the crucible of intent. No thought, no worry, no past, no future, no focus beyond the moment when all the factors and variables evaporate and there is only peace. Harmony, even. How long did it last? Not long since warrior poses are still a bit of a challenge for me and I fell out, practically on my head. That arching back thing is way harder than it looks. But the moment was there, however brief and fleeting. And glaze was a success. It's a basic copper matte that has been done to death in pottery circles but I still love it. Beautiful metallic colors and crazy effects, along with smoke, fire and no shortage of danger is why I got into pottery in the first place. I have more bisque ready to go so we'll be visiting with the glaze again in the near future, maybe even with some of the larger pieces I've been working on. But speaking of projects, I racked out the latest melomel mead. I gave it a taste during the transfer but I can't tell yet if we obtained honey-peachy goodness. I used frozen peaches which wasn't discouraged in all the online sources but wasn't considered optimum either. But I didn't think about a peach mead until after the local peach festival so it's my own fault if this just doesn't work out. The melomels and sweetened meads are a bit more trouble than they are worth, I'm finding. I prefer dry meads anyway and I think I want to start working with larger batches. You can get about four 750ml bottles out of a 1 gallon carboy which should translate into about twenty bottles out of a 5 gallon carboy. Now that I have the procedure down, I 'm not as worried about ruining a large batch. Still thinking about bees so I can harvest my own honey but do I really need another project? 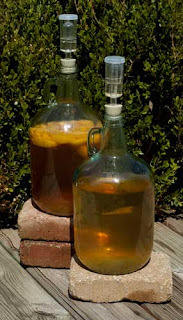 But it wouldn't it be cool to make mead with your own honey? Eh, we'll leave "bee keeping " on the future project list and see what happens.